The City of Toronto is proud to announce the winners of the Everyone is King: Design Build Competition and the installation of the public spaces and patios along the King Street Transit Pilot. 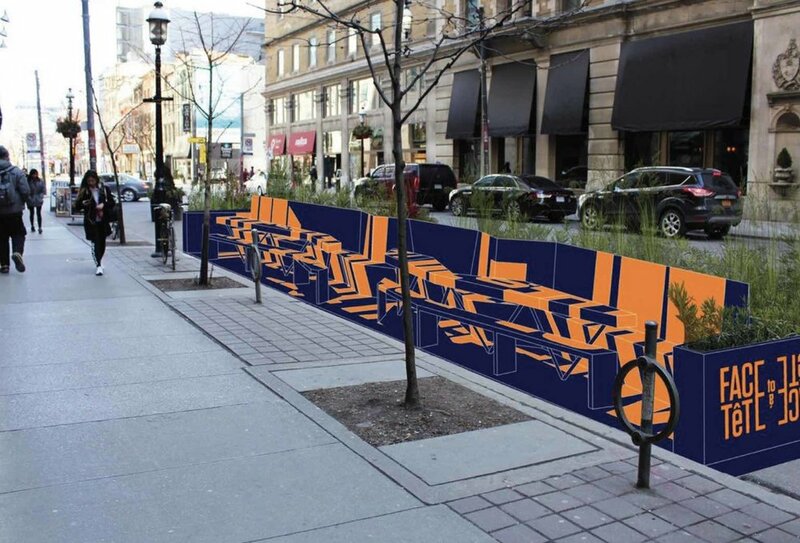 Almost 30 activations will be installed along King Street between Bathurst and Jarvis Streets to add to the vibrancy of the street. The rollout of these installations has begun and most will be completed by the end of May, weather permitting. Most of the installations will remain for the duration of the transit pilot. Earlier this year, the City held a design build competition called Everyone is King to seek out design ideas for the public spaces. The winners of that competition are listed below. Seen below, the first winning project to be installed was a parklet called Face to Face/Tête à Tête. This installation was designed by PLANT Architect Inc. in collaboration with Oriole Landscaping Ltd. It is located on the north side of King Street East between Victoria and Toronto Streets. Face to Face/Tête à Tête is the first of two destination parklets to be installed. A parklet is a durable, accessible seating area or green space placed adjacent to a sidewalk in the curb lane. Two parklets will be installed. The second parklet, called King Street Causeway, was designed and built by IBI Group in collaboration with PCL Construction. It will be installed today, weather permitting, in the west end of the King Street Transit Pilot area in the Entertainment District. A number of public space activations will also roll out this month. Everyone is (a) Kid has been installed adjacent to David Pecaut Square, and Watch Your Step!, Woggle Jungle and King’s Buried Treasure will soon welcome visitors to King Street. • Various business-operated outdoor café spaces and public seating areas – up to 16 cafe patios and three business operated public installations will be installed. • Four student and recent graduate projects from a City of Toronto and Ryerson University Office of Social Innovation partnership called ShapeLab. The curb lane public spaces between Bathurst and Jarvis Streets are currently delineated by planters. Local businesses were offered the opportunity to claim the public spaces on the block adjacent to their business for their use. Spaces not claimed by local businesses were included in the Everyone is King design build competition. Rendering location differs. Street edge divider not shown. Credit: PLANT Architect Inc.